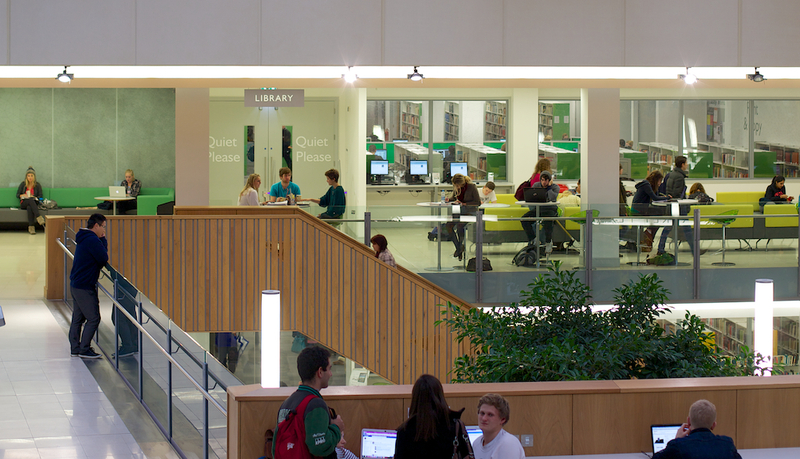 We know that the Forum Library can get very busy during peak times of day, especially as deadlines or exams approach. You’ve told us that it causes problems when other Library users take up more than one space or “save seats” by leaving their belongings and then going away. In response, we worked closely with the Student’s Guild Representatives and with individual students to come up with guidelines for using study seats in our Library spaces. 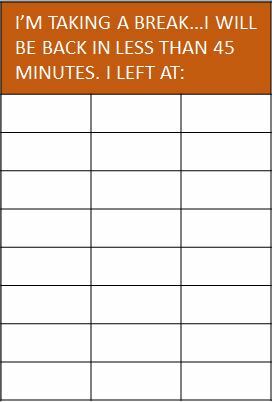 When taking a break of up to 45 minutes: please always leave a card, fill in the time you left and be sure to return on time. If you will be gone longer than 45 minutes: please clear your desk so that others can use the space. Remember the Library is a public space! Never leave valuables unattended; always take them with you. 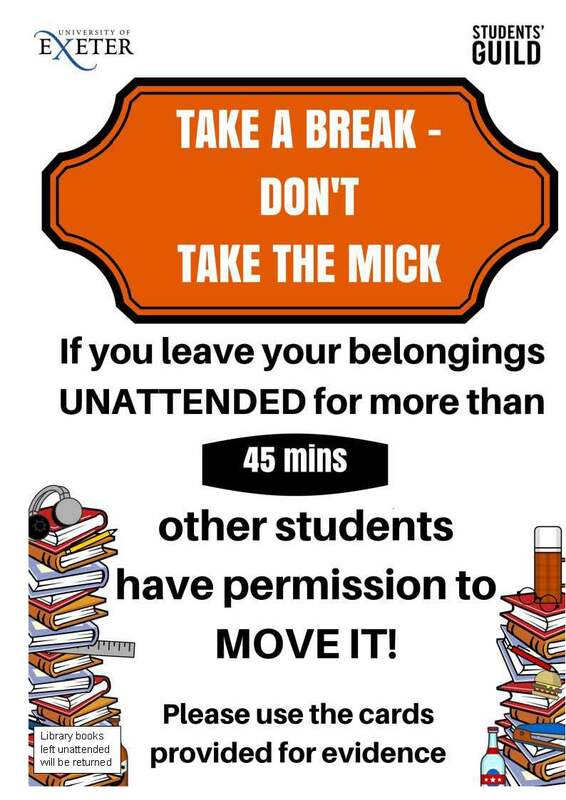 If you find a desk that has been left unattended for over 45 minutes then you have permission to move any belongings to the side and use the space. Each card can be reused multiple times. This is a student-led scheme. Let’s work together to uphold these guidelines and make the most of shared library spaces. This entry was posted in Study Spaces and tagged Forum Library, library behaviour, study spaces on 9th May, 2018 by reg206. 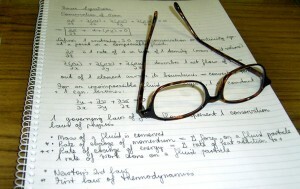 Are you gearing up for the exam season? So are we! We know that study space provision is hugely important during the revision and exam period, so this is why we’ve been busy expanding our seating and arranging extended opening hours in our study centres across campus. Here’s a brief to guide to the improvements we’ve made and the study spaces that are available for you over the next month or so. There are a few changes to watch out for. More seating! 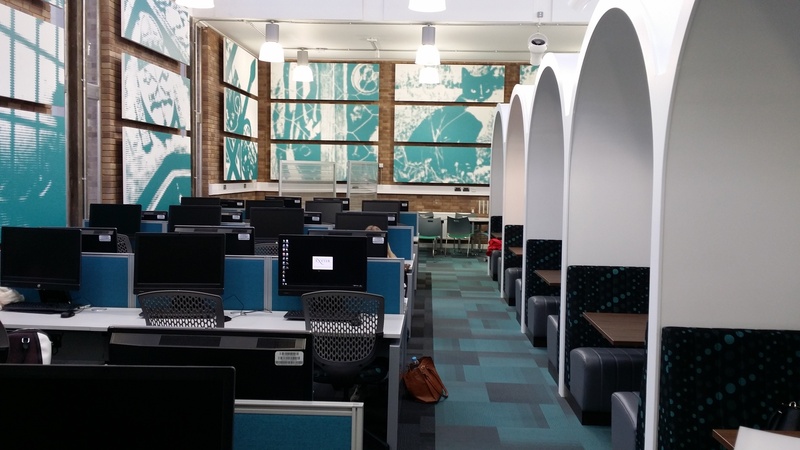 This week we’ve added 44 brand new study spaces, split between the Law Library (Level -1) and Level +1. This is in addition to the new seats in Express Collections added earlier this year. Seminar Room access via the Library. 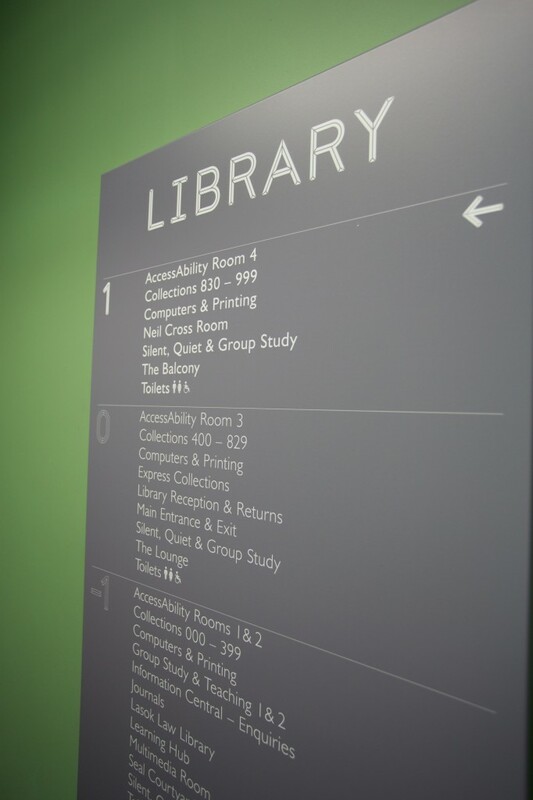 From 09.00 on Friday 27th April the Forum Seminar Rooms on levels 0 and +1 will become part of the Library, further expanding the study spaces that are available to you 24/7. Remember to enter and exit these rooms via the Library (through the doors by the computer clusters) not via the Forum. Open 08.00 – 20.00 Monday – Friday, 10.00 – 18.00 at the weekend. 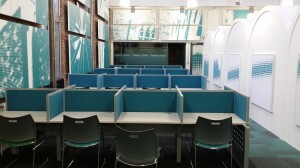 24/7 Study Space available in the Luke’s Library computer room and 24/7 room. Don’t forget study seats are also available in the Student Services Centre, Forum Street Balcony, Forum Expo Labs and in many other buildings across our campuses. You can check availability in advance using the iExeter app. 2) It is OK to take a break for about an hour (60 minutes) if you are working in the library for a long time; but always return promptly within one hour. 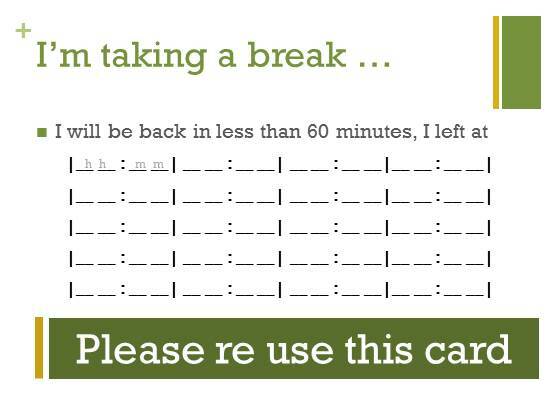 leave one of our Taking a Break cards so others know you are coming back. 3) Remember the Library is a public space! Always take valuables with you or lock them safely in a Forum Locker. 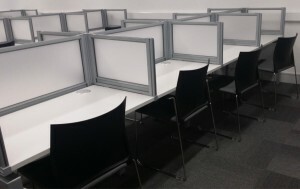 This entry was posted in Study Spaces and tagged 24/7, exams, Forum Library, improvements, study spaces, Taking a Break Scheme on 16th Apr, 2015 by reg206. We’re really pleased to be in the process of installing almost 50 new study desks in the Forum Library, just in time for the exam period. The new study spaces will be located in the Lasok Law Library (Forum Library Level -1) and on Level +1 outside the Neil Cross group study room. We recently added new study desks in Express Collections, now even more are on the way! While these spaces are being cleared and the new desks installed you may experience some disturbance in the vicinity of these spaces between now and April 17th. We apologise for this but are confident that the end result – more study seats in the ever popular Forum Library – will be worth it. If you’re looking for silent study space in the next week it might be worth avoiding these two areas of the Library. Why not use the silent study room on Level 0 which is well away from the areas affected? Other great quiet spaces to study on Steatham Campus this week include Research Commons, The Loft or the Amory Study Centre. Find out more about these and other available spaces on our website. This entry was posted in Forum Library, Study Spaces and tagged Forum Library, improvements, noise notice, study spaces on 9th Apr, 2015 by reg206. Looking for study space on St Luke’s Campus? Why not try Giraffe House? This brand new space opened on 7th January and can be found above Cloisters Café. In line with other study spaces, such as The Loft and Amory Study Centre, Giraffe House is open 7 days a week, from 08.00 – 21.30 with extended opening during exam time (we’ll let you know the details of this nearer the time). Giraffe House is open to all students but access is via swipe card only so you will need to bring your Unicard to make use of this space. 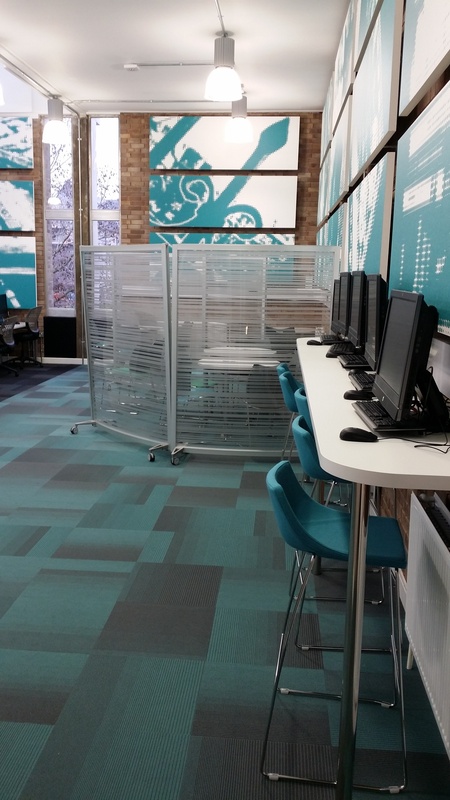 Do you like the décor in Giraffe House? The furniture and colour scheme were chosen following feedback from SSLCs last year, and also reflect features that have proved popular in other study spaces such as the ‘railway carriage’ booths which were first introduced in the Amory Study centre. The art on the walls displays various views and features from around St Luke’s campus – even including the cat who is a regular campus visitor! 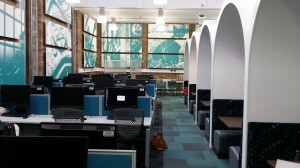 We think Giraffe House is a great place to work and a welcome addition to Exeter campus study spaces. Why not check it out if you haven’t done so already? “Carriage” booths and PCS. Spot the cat! This entry was posted in Luke's Library, Study Spaces and tagged improvements, St Luke's, students, study spaces on 15th Jan, 2015 by reg206. 1) . More study seats in the Forum Library. From 2nd – 10th January 2015 the Seminar wings on levels 0 and +1 of the Forum will become part of the Library. This means you can enter and exit these spaces through the Library (via the doors next to the computer cluster) rather than from the Forum side. The rooms can be used for quiet study, increasing our available seating t0 1044 seats! And don’t forget the Forum Library is always open 24/7 to support your study needs whatever time of day or night you choose to do your revision. 2). More seats in Express Collections. We’ve added extra desks and study seats in the popular Express Collections area, increasing our study space even further in time for the revision period. These desks are available now. 3). The Loft goes 24/7! 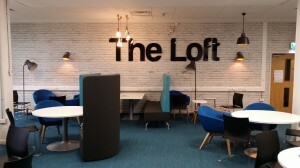 The Loft in Devonshire House has been open since October. Have you studied there yet? From 2nd – 10th January we’re extending the opening ours of this space to make it available 24/7! Just 2 minutes walk from the Forum Library it’s a great place to go to study – any time! 4). The Amory Study Centre goes 24/7! From 5th – 10th January we’re also extending the opening hours of the ever popular Amory Study Centre, so this too will available 24/7! Located in the Amory Building, just 4 minutes from the Forum Library, the Centre offers a great mix of quiet study space and bookable group work rooms. 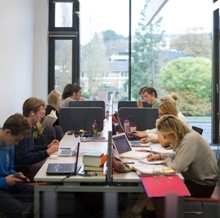 Why not check out our website for full details of all the study spaces available across campus? You can also use the space checker to check in advance how many desks are free in each area. 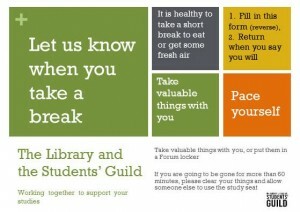 And don’t forget always leave one of our Taking a Break cards on the desk if you will be gone for less than one hour. If you are going to be gone for more than 1 hour please clear your things and allow someone else to use the seat. This entry was posted in Study Spaces and tagged 24/7, Forum Library, improvements, study spaces on 28th Dec, 2014 by reg206. Christmas is coming! Whether your response to this is “Hooray” or “Humbug” it’s a good idea to plan ahead this time of year. So here’s what you need to know about our Library Services over the coming weeks. You can check our full opening hours for all Library sites on our website here. The Forum Library: will be open on a self-service basis 24/7 to registered staff and students throughout the break. You must have your Unicard to enter the building and to borrow items. Vacation opening hours for Research Commons are 09.00 – 17.30 Monday – Friday and 10.00 – 18.00 at the weekends up until 23rd December. The building will be closed from 24th December – 2nd January inclusive so why not study instead at The Forum Library during this time? Vacation opening hours for St Luke’s Library are 09.00 – 17.30 Monday – Friday and 10.00 – 18.00 at the weekends up until 23rd December. The building will be closed from 24th December – 2nd January inclusive but 24/7 study space is still available over at The Forum so why not head there instead? You are welcome to borrow our books over the vacation, although we always advise against taking Library books abroad. If you do take our books home with you then you need to note the following. Our recall policy is in place until the 12th December (the last day of term). This means books can be recalled and the due date shortened up until that date. Further information about our Recall Policy is available here. We will send you an email if your books are recalled, and you will have 7 days to return them – by post if necessary. If your items they are not recalled before the 12th December, then they will be due on or after the 5th January 2015. As for renewals, you may continue to renew throughout the break unless someone else places a request or recall on the books. We expect borrowers to return books as soon as possible to ensure fair access to all our resources for all students, and it is fine to return recalled items by post if you are not going to be back for 5th January. If you are concerned about keeping your record up to date over the vacation, why not use our scan to email facilities to make PDFs of key sections before you go? Don’t forget we have an extensive collection of electronic resources that can be accessed online from anywhere, so it may not even be necessary to take the print copies away! Have a great Christmas, however you choose to spend it. This entry was posted in Forum Library and tagged 24/7, services, study spaces on 10th Dec, 2014 by reg206. When taking a break of up to one hour: please always leave a card, fill in the time you left and be sure to return within 60 minutes. If you will be gone longer than an hour: please clear your desk so that others can use the space. Each card can be reused up to 20 times. We hope you will continue working with us to make the “Taking a Break” scheme a success. If would like to share your thoughts on the scheme then please send us an email or fill in one of the comments cards you’ll find around the Library. This entry was posted in Study Spaces and tagged Forum Library, study spaces, Taking a Break Scheme on 8th Dec, 2014 by reg206. 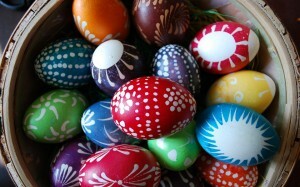 Easter Holiday Weekend: we are open! The Easter Holiday weekend is fast approaching. For many of you, plans for the coming weekend may involve church or chocolate but with Easter falling late this year and exams fast approaching we understand that revision might also be on your agenda. If this is the case then we’re here to support you and the good news is that Forum Library will be open as normal throughout the holiday period with only slightly reduced opening hours at Research Commons and St Luke’s. You can check the full opening hours for all our libraries on our website. But here’s a quick at-a-glance guide to help you plan your week. 24/7 throughout. You must have your Unicard with you. The Amory Study Centre will be available for use on 20th and 21st April but please note the Amory Study Centre will be closed all day on 18th April, reopening 12.00 noon on 19th April, while essential electrical works are carried out. Please ask Library staff if you need help finding an alternative study space during this time, or why not check out the full list of available study spaces on our website? This entry was posted in Using the Library and tagged Forum Library, opening hours, Research Commons, St Luke's, study spaces on 14th Apr, 2014 by reg206. 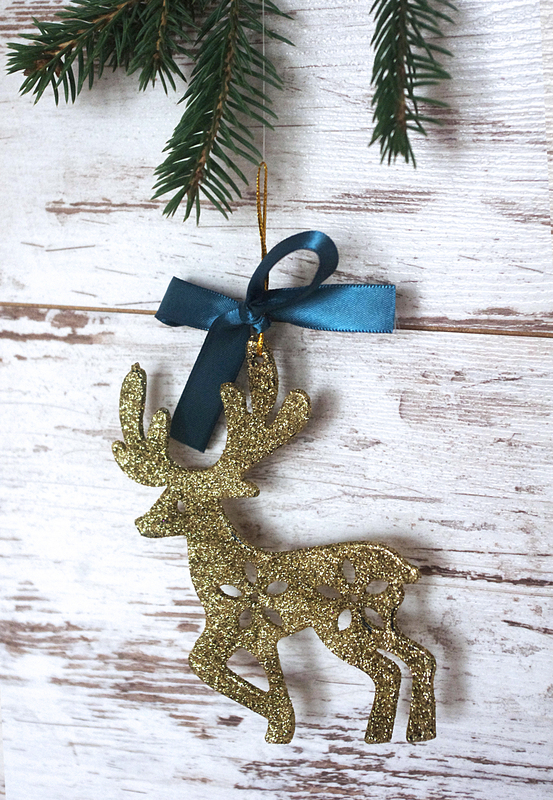 We hope you’ve had an enjoyable Christmas! Now New Year is looming and unfortunately so too are the January exams. Here in the Library we recognise that the run up to exams is time when Library study spaces are in particularly high demand. This is why during revision periods we increase the number of study seats available in the Forum Library by making the seminar rooms on Level 0 and level +1 part of the Library. A View of Forum Level +1. The Forum Seminar Rooms will be dedicated for silent study from 2nd January. Enter them through the Library. 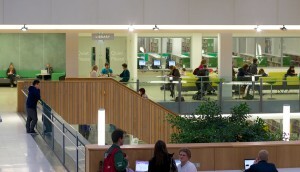 More quiet study spaces in the Forum Library with capacity increasing to over 1000! From noon on Thursday 2nd January access routes to the Forum Seminar rooms will change. You’ll need to enter and exit these rooms through the Forum Library using the doors by the computer clusters which will then be open. There will be no access to these rooms from the Forum end by the Alumni Auditorium. The seminar rooms will remain a part of the Library until 12 noon on Sunday 12th January. Don’t forget there are plenty of other revision spaces available for you during this busy period. Why not take a look at the full list here? During times of high pressure study it’s more important than ever that you respect fellow Library users and help reduce stress for those working around you by following Library behaviour guidelines. If you are in a silent space please respect the rules and if you need to talk move to a designated group work room or to one of our breakout spaces. 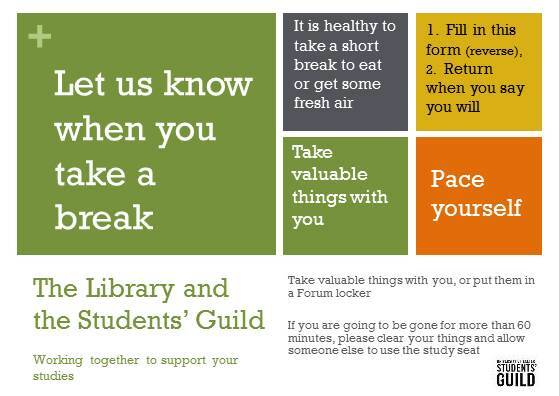 Also, if you are taking break of up to 60 minutes don’t forget to fill in one of our “Taking a Break” cards, available from holders around the Forum Library. If you will be gone longer than 1 hour please clear the desk to allow others to use the space. Library staff will be roving throughout our spaces and are here to help, so if you are being disturbed by noise, need help finding a seat, or if there’s anything else we can do to help just ask! This entry was posted in Forum Library and tagged Forum Library, library behaviour, revision, study spaces on 30th Dec, 2013 by reg206. Many of you may be leaving Exeter for the Christmas vacation; if you are then we hope you have fantastic festive season and a relaxing break! But here in the Library we also understand that some deadlines loom large in January and so we’re here to support those of you who are planning to stay and study during the festive period. St Luke’s Campus Library PC cluster and 24/7 room 24/7 swipe access for registered university members available throughout the vacation. St Luke’s Campus Library Open daily except 25th& 26th of December and 1st January. See our website for full times. Research Commons Open until 17.30 on December 24th then closed until 09.00 on 2nd January 2014. Amory Study centre Open for study until 16.00 on 24th December then closed until 08.00 on 2nd January. The Sanctuary Open for study until 24th December. Closed 24th December- 2nd January then in use for exams. This entry was posted in Study Spaces and tagged 24/7, Forum Library, study spaces on 17th Dec, 2013 by reg206.